Peaceful to other species, aggressive to similar species/fish. Japan Surgeonfish can grow up to 18 cm what is approximately 7 inches. In general, 1 specimen requires at least 2160cm2 of water surface which is approximately 334 square inch. It is recommended to raise this species in fish tanks that are medium. (e) Medium aquariums have at least 113 Litres (30 US Gallons). Large aquariums have at least 265 Litres (70 US Gallons). Very large aquariums have at least 700 Litres (185 US Gallons). It is easy to keep the Japan Surgeonfish. (e) The specific gravity (SG) should be between 1,020 and 1,025, the temperature between 23°C (73.4°F) and 26°C (78.8°F). The suggested level of pH (a measure of the acidity/basicity) is between 8.0 and 8.3 which is usual for most marine fish. You should not keep this fish with similar species and of course with venomous and aggressive fish. It should be peaceful to other fish, but can be territorial and protect it’s own place. When you want more tangs in one tank, firstly the tank should be large, so every one has it’s own place and secondly, they should be introduced to the tank at the same time. Tangs tend to bully the newest guys. The Japan Surgeon should be kept in aquarium with lots of swimming places and stronger water current, but the tank should also offer hiding and sleeping places made of corals and rocks. They will not pick on corrals, so you can have them in one tank together without fear. Rocks are important not only as a hiding place, but as a source of algae, because this fish is an algae eater. 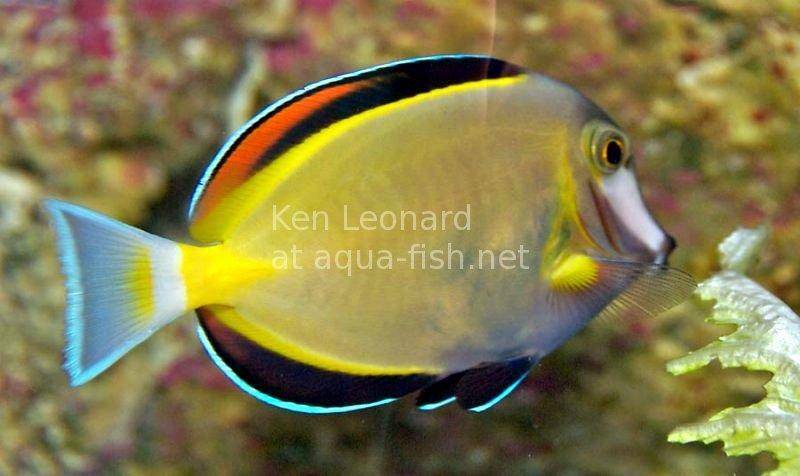 When you buy this fish, it can take some time for them to acclimatize and they will not eat. This is why it is important to have algae in the tank before you bring this fish home. When they start to feel more comfortable in the tank, they can pick the algae and get some nutrition and they do not have to wait until feeding time. Not to mention, that also feeding time might stress them, because you come close to the tank, and also other fish can stress them as they swim around like maniacs while they are eating. But there is no guarantee, that they really acclimatize in you tank. Some might be too stressed from the change of environment ? this fish do not breed in tanks, so if you buy it, you know, that it once lived in the nature. Once, when the fish is acclimatized, the fish becomes hardy. This fish is a herbivore, so you can feed them dried, or even frozen food that contains mainly salt water algae and even it can contain shrimps. You also can add some home made food into their menu like boiled or frozen broccoli zucchini and spinach. But algae should be their main food. This fish graze on algae in the nature, so it is used to eat most of the time. That is why you should feed them more time a day and give them small amounts of food. To make them more hardy, you can even add some vitamins into the water or food. 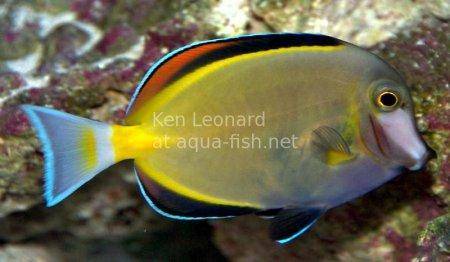 Feel free to share your experiences regarding keeping Acanthurus japonicus below. Every message will be held for approval by our moderators. It usually takes 24 hours to publish your comment. Before you ask anything, browse the questions page, please. "Japan Surgeonfish." saltwater.aqua-fish.net. Fri Feb 6 0:33:23 UTC 2009. Aqua-Fish.Net. Sun Apr 21 6:09:18 UTC 2019 https://saltwater.aqua-fish.net/?japan-surgeonfish.